→ veticalresponse.com seems hosed - is there a new virus in the wild? → posted this comment to the folks at KelbyTrainingLive.com / purveyors of fine Photoshop seminars. Today I will be completing the move of motherboard and associated hardware into the case where an Asus P3C-D - Dual Pentium (Slot 1) with 2@ 800 MHz processors 1/ 1GB RDRAM used to live. About 6 months ago the power supply began failing, during installation and testing of out portable generator I shut it down and it has not been up to full multiprocessing mode since. The boot drive, a 500GB IDE drive needs to be replaced and the information on it recovered, but the largest IDE drives I can find locally are 320GB and that's not large enough. Based on the vintage of the Linux on the machine, the age of the motherboard, failing powersupply and general need to consoludate this and another Linux box who has a few noisy fans into a single machine. I am moving a Giga-Byte GA-8KNXP with 3.2GHz, single core, Hyper-Threaded, 2GB memory into the case, freshening some of the optical drives and adding 2@ 3TB WD Red drives for migration of storage from some of the old IDE drives. I'm playing with a CISCO WAP4410N and I'm looking for the SNMP MIBs that apply to it so that I can do snmpwalk or the like and gather statistics. I've got this URL: http://tools.cisco.com/Support/SNMP/do/BrowseMIB.do?local=en&step=2 which seems quite happy to give me MIB files if I can figure out which ones I want. Folks, I hope everyone over here in LJ land is still doing reasonably well. 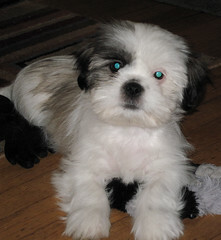 Some pics of our Shih-Tsu puppy - JD. Yes, the last two half-gallons of skim milk have started to turn sour a day and days before the date on the container. I suspect the refrigerator may be the culprit. As some of you may know I have a penchant for remote monitoring, there are sensors in and around the camper in season, there are sensors in and around the apartment and the house. All dutifully monitored and watched over by rescued laptops or re-purposed network devices (NSLU2). I need more coffee I think. Thank you for choosing Neustar. A representative will be with you shortly. Jon N.: Hello. How may I assist you? you: it is blocking access to their servers. Jon N.: I dont have access to that type of system. you: good day & good luck! I am grateful to receive e-mails about the NYC tour, but The Javits Center is heinous and I prefer to attend your presentations and seminars in Philadelphia where the presentation space is located nearer to good food. Again because, IMO, the food vendors in the Javits Center are sad and the food inside is overpriced and nasty. I also think its ridiculous to have to wait on line for 20-30 minutes at a hot dog cart across the street from the venue because that's the only place you can get decent tasting and not-overpriced food. So please sign me up for notification for your presentations in the Center-City Philadelphia area also. In CSS (and possibly JQuery) - Is there a way to make one of several collections within <div id="aa01">...</div>, <div id="aa02">...</div> ... etc tags to just simply disappear and relinquish their space until I want the grouping to appear and take up space on the page by changing some properties of the aa## tag? There will be several groupings identified by id="aa##" and I only want the non-hidden grouping to actually take up space when its visible - its for a page switching effect for an image gallery menu. The page is build by a PHP script currently and the thumbnails just stream two-by-two down the page. I want to create some kind of page switching menu so that the page length will remain manageable. I've created another, simpler PHP generated page and I'm using logic to determine the group number and id aa##. I've got CSS that will make the first grouping initially visible and hide all the others - partially working. The hidden/visible part seems to be working, but the hidden groups are still taking up space on the page, so the page, with 5 of the 6 groupings hidden, is as long as it was when all the groups were visible. I haven't (yet) found the way to make the hidden groups take up NO space on the page, or stack on each other below the visible grouping. I'll be using the JQuery framework, because there is a JQuery plugin already on the page and some other suitable plugin to modify the aa01, aa02... tags to do the visible / invisible stuff.